The third Jonathan Intégrale collects the Jonathan stories 7,8 and 9. Like the first two Intégrale volumes, this album contains a dossier and three stories. This time, the dossier consists of an interview with Cosey about the creation of the three stories in the book. So there is no piece of a second writer, like in the earlier books. Personally, I prefer this single piece dossier. It gives more room to present source material and Cosey’s story about the albums. Cosey told me that the colour corrections of the Jonathan stories would be executed for the albums 1 to 8. 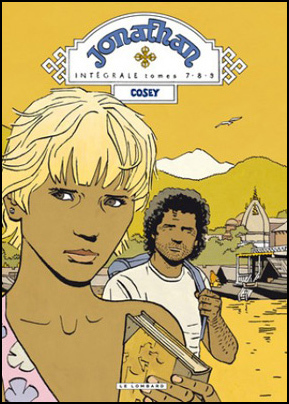 So story 9 (Neal & Sylvester), colours by Fraymond, should not have been digitally enhanced. In the Intégrale itself I could not find any details if this is true. The printing quality of the Intégrale is so much superior than that of my old editions, that the colours are much better, corrected or not. 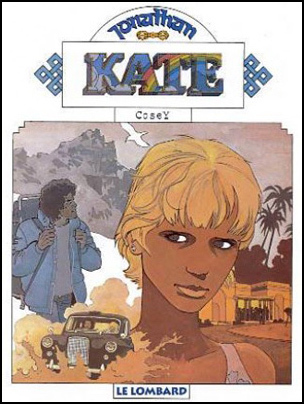 The cover of the Jonathan Intégrale is a remake of sorts of the original (1981) Kate cover. As in the first two Intégrales, Cosey has retaken the main componenet of his collage like drawing (in this case Kate) and has he-shaped the image as a scene from the album. 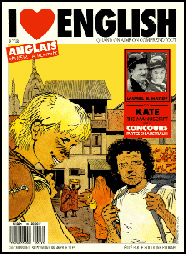 Take a look at this cover of ‘I love English’ (1988)… although it is a very bad quality picture, compare the Jonathan figure with the Intégrale cover.